Mazda 2 to cost from 7999 | What Car? The three-door model of the Mazda 2 will cost from 7999, and it's on sale now. 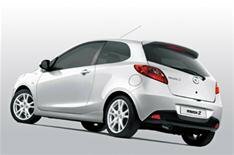 The car is available with 74bhp and 84bhp versions of a 1.3-litre petrol engine or a 67bhp 1.4-litre diesel engine. A 101bhp 1.5-litre petrol motor will be added from the end of July. There are three trims: TS, TS2 and TS2. Standard kit is the same as the five-door model's, although the front seats tilt and slide to allow access to the back, the rear windows are not electric and the side sills available with the Sports Styling Kit are a different design. The car is expected to get a five-star Euro NCAP rating, as achieved by the five-door model.